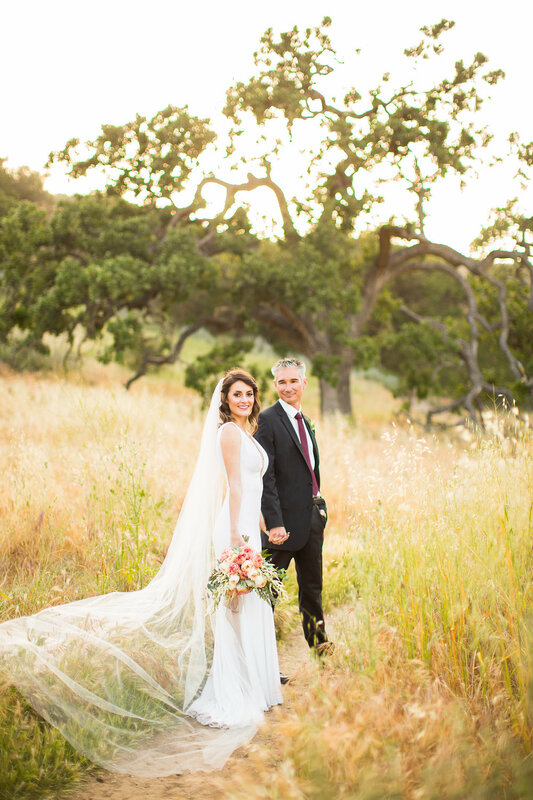 While scouting locations for my Portrait Session with Katrina Jayne Photography we stumbled across this AMAZING tree at Triunfo Park in Westlake Village, CA. The tree is surrounded with mountains and tall golden grass everywhere we looked. It really is a magical location and we both felt immediately inspired by its beauty. Spring seems to come and go so quickly here in southern California and we felt the immense urge to capture this moment in time. So we decided that we just had to do a styled shoot there while it was still springtime! The models for this shoot were the easiest decision we made. Daryn has been a friend of mine forever and I knew that she and her husband, Jason would love to have some professional wedding photos taken. Daryn and Jason have been married for four years and they are the most easy going, fun loving couple I know. They met here in California fell madly in love and then moved to Jason’s hometown in New Zealand for a few years where they were able to have many adventures traveling and living life to the fullest. 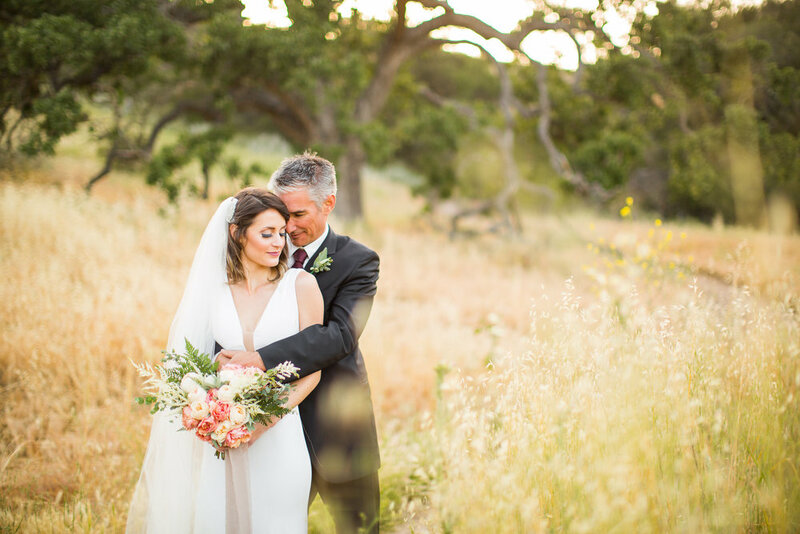 When they decided to settle down and tie the knot they moved back to California where they had a beautiful ceremony at the Santa Barbara Courthouse followed by a backyard reception with a group of their closest friends and family. The night was complete with great music, great food, and enough drinks to keep the party going! The one thing that was missing from their perfect day was a photographer. So our impromptu shoot became the perfect opportunity to capture their love four years later just in time for their anniversary! 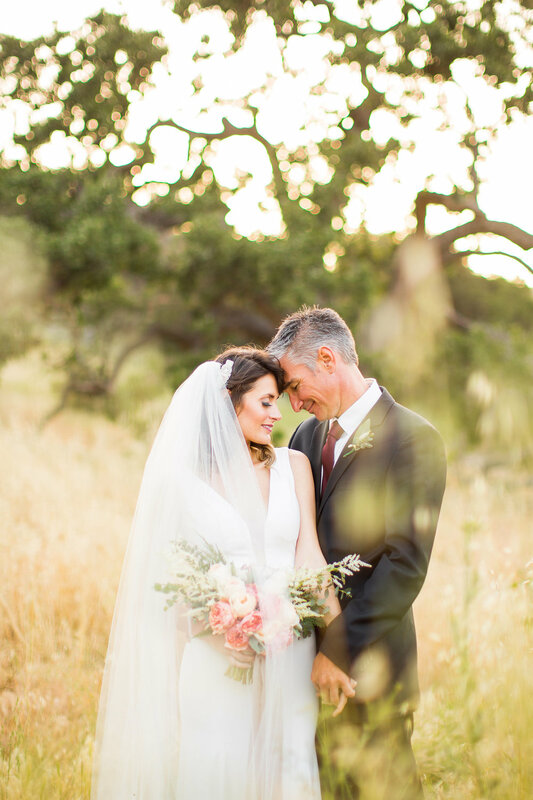 And thus became this gorgeous earthy romantic inspired spring anniversary session for Daryn and Jason. When styling this shoot we didn’t want anything to take away from the natural beauty of the location or our models so we went for neutral earthy tones such as ivory, taupe, green, and a pop of peach for spring. Kelsey from Darlingtonia Designs created this unbelievable heart shaped bouquet that just screamed natural beauty. 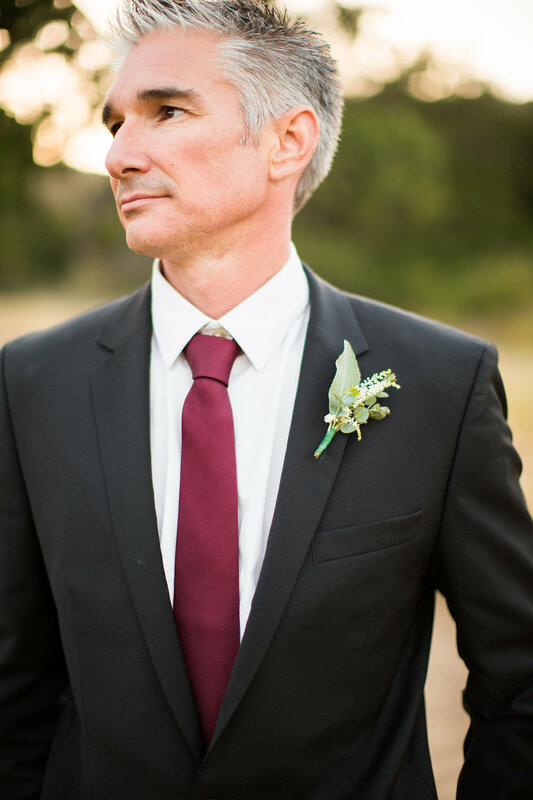 The flowy taupe chiffon ribbon from Bellame Ribbon added the perfect romantic flair to the bouquet. We didn’t want anything to overshadow the shoot so for furniture we decided on a subtle burlap upholstered chair that looked almost as if it grew right out of the ground. And then there is the absolutely gorgeous Jovani dress that seemed as if it was made just for Daryn. The form fitting dress with an effortless romantic train was perfect for the look we were going for. 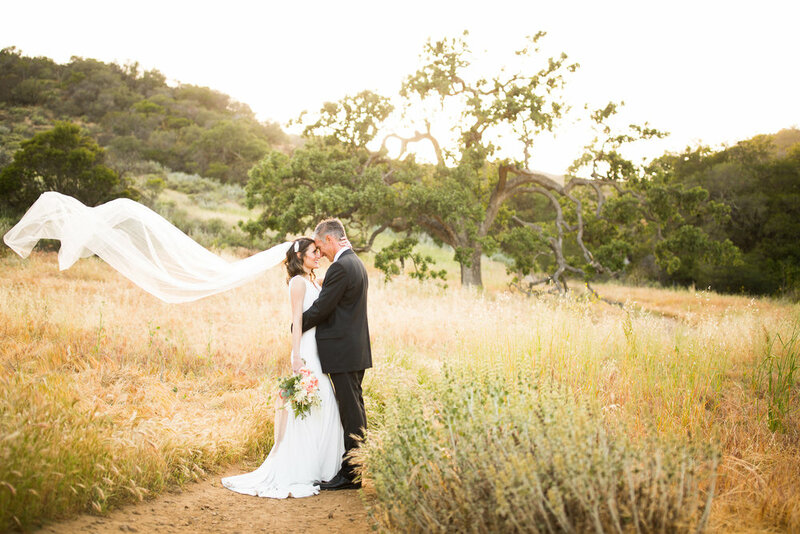 The cascading veil and crystal hair comb created just the right amount of romance. 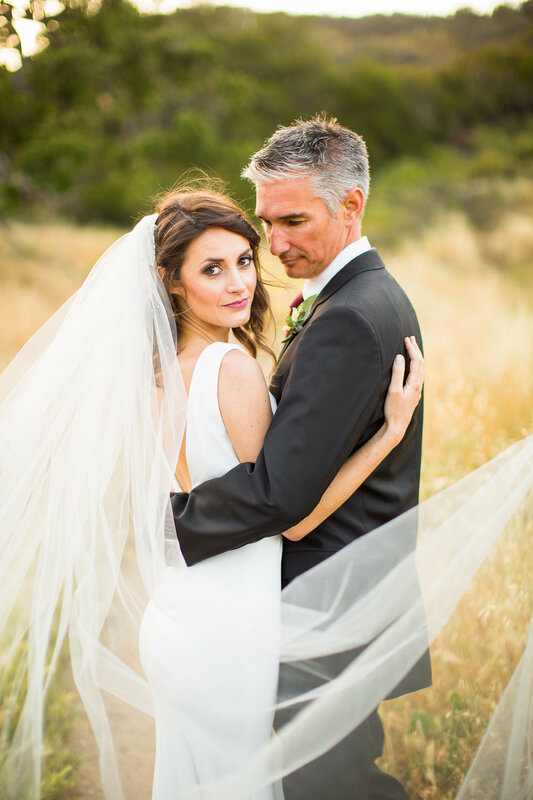 The talented Meredith from Bespoke Bridal, Etc. gave Daryn a fresh face with a dramatic eye, perfect mauve lip, and natural waives. Jason and Daryn were so fun to work with. Jason was cracking jokes the entire time it is a miracle we were able to get any shots of Daryn not hysterically laughing. They made the shoot fun and entertaining and you could see how their relationship is full of laughter and love even after four years of marriage. 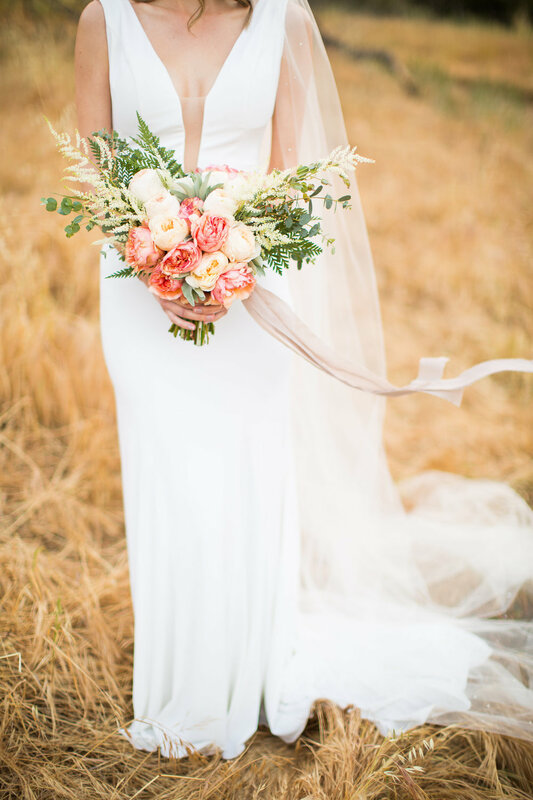 The shoot was the epitome of earthy romance and we had so much fun putting it together! You would never know that we planned and shot the entire shoot in just a few days! It is proof that when inspiration strikes so does the motivation to make something beautiful happen! I couldn't have been able to pull off this styled shoot without help from our wonderful vendors! Follow them here! So what's your favorite part of this anniversary shoot? Let me know in the comments below! For more photos from this gorgeous session, check them out here on Pinterest! Planning your own wedding? Sometimes the hardest part of planning a wedding is simply knowing where to start. We are here to help carry out your wedding vision and flawlessly execute it! All JAE collections have been carefully created with the needs of every client in mind. If you would like to request a quote, contact us here.